What is the back channel? One of my topics was the back channel. The back channel is what your audience is saying behind your back, or perhaps at the back of the room. These days, they usually make their comments using Twitter and a hashtag. A hashtag looks like this: #opw2011. It’s a label preceded by the # symbol. In Twitter, people write tweets that include the hashtag. Then, they search for the hashtag, either at Twitter’s own site or using one of many third-party tools. In this way, members of the audience can see what the other members are saying about your presentation. Live conferences often provide a hashtag, so that people can tweet about the conference and spread the word. Many people who can’t attend follow the sessions by reading all the tweets. 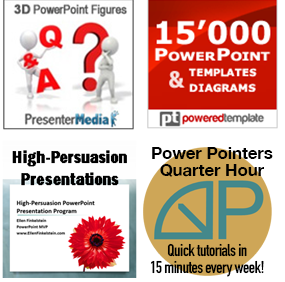 It can be very useful as a presenter to know what members of your audience are saying! Maybe they don’t understand something and you can clarify your point. Or maybe they find your presentation boring and you can liven it up. On the other hand, it can be distracting. Some presenters use an assistant to monitor back channel comments. Others watch the back channel only during breaks or the Question & Answer period. If you’re on Twitter, you can use the Search box at Twitter.com and enter a hashtag to find just tweets that contain the hashtag. Some other tools that let you filter tweets for a hashtag are HootSuite and Tweetchat. 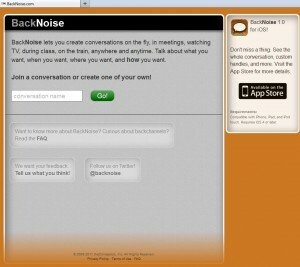 BackNoise: It no longer lets you use your own name, which means all comments are anonymous. TodaysMeet: You must enter a name, but you can use “anonymous” if you want. Give people a conversation or room name, and they can go to one of these 2 sites and see all the related comments. (You’ll have to choose one of them; they don’t work together.) In this way, people can communicate with each other. Yup, let’s do it! Between November 1 & November 6, go to TodaysMeet. The link includes the conversation name. Then write something about the back channel. Have you used it? What do you think about it? After November 6th, this back channel room will expire. is it possible to have the powerpoint running on-screen and have the backchannel on-screen on the laptop? or even on the screen in a split window perhaps? I love the idea of engaging those who are not into my training session and using their comments to bring everyone into the training discussion. thanks! I was dissappopinted to read this article as a plug for twitter. How about using feedback forms? Twitter is ridiculous and should not be considered as a serious business tool. Feedback forms don’t let audience members see each others’ comments in real time and they don’t let the presenter see audience comments as they happen. I think I trust that the other scenario is more true… They agree they like it. Oh…for lectures and workshops I regular ask them to twitter their evaluation. It’s a risk, but it often Leads to great online endorsements. @Greg, personally I agree with you, but the reality is people do use it, so your choices are to ignore an important tool or grit your teeth and roll with it. As Ellen sagely points out, people DO use it during presentations and it would be difficult to stop them.